SIMPLE STEPS TO GET MORE FLEXIBLE! In this Continuing Education program, Roger will teach you the real reasons why most golf swing faults aren't necessarily "habits", but rather symptoms of anatomical functions or dysfunctions in key muscle groups due to lack of flexibility. 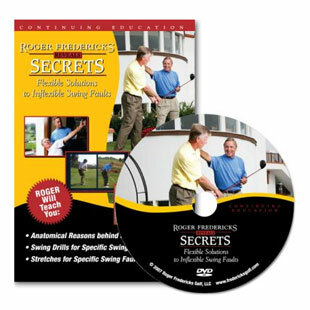 Roger will then teach you how to effectively diagnose and treat these specific swing faults with Golf Drills and Flexibility Exercises designed to get these nagging faults out of your swing - for good! If you have a nagging swing fault that just won't go away, this program will teach you how to get them out, and achieve a more fluid and powerful golf swing.